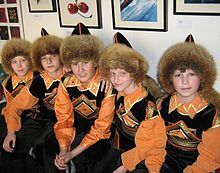 Bashkir boys in traditional ethnic clothes. Of or pertaining to a certain Turkic ethnic group that lives mostly in the Russian republic of Bashkortostan. A Bashkir person; a member of the Bashkir ethnic group. A Turkic language with many dialects, spoken in parts of Russia, Uzbekistan, and Kazakhstan.